IBF Pan-Pacific Light Flyweight Champion Randy Petalcorin (W28 KO22 L2 D1) is happy and confident as he grinds in his training camp to prepare for his upcoming October 29 world title against Felix Alvarado (W33 KO29 L2 D0) The bout will take place at the Solaire Resort and Casino, Manila. At stake will be the vacant IBF World Light Flyweight Title. The event is being promoted by MP Promotions, Sanman Promotions, Peter Maniatis Events and ESPN 5. “I am in the best shape so far. I have sacrificed a lot and gave my everything for this fight. Alvarado is a world class fighter but fights are won in the gym and I am confident I am 100% ready. 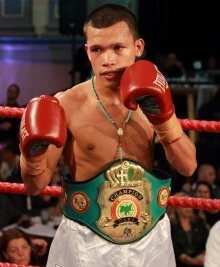 On October 29, I will get that world title belt and will become a world champion once again”, Petalcorin said. Randy has trained with four sparring partners and has sparred for a total of 110 rounds and counting. He trains at the Sanman Gymn in General Santos City under the watchful eyes of head trainer Fernando Lumacad and assistant coaches Jonathan Baat and Marquil Salvana. The fight will be televised live on ESPN 5 at 7:15 to 9:30 PM while undercards will be shown at 3:30 PM (Aksyon TV) Philippine standard time.